Humbled by the vote of confidence her peers have shown in her by electing her to the position, Kerr stopped by KXAN to talk about the honor. Assistant City Manager Rey Arellano considers the honor elite. The Austin Fire Department says if you’d like to celebrate this historic moment, you can make a donation to the Austin Fire Foundation by visiting the Austin Community Foundation website. It says all funds will go towards the Austin Fire Department’s community outreach and public education initiatives, including the installation of free working smoke alarms. If you or someone you know needs smoke alarms, please call the Austin Fire Department’s smoke alarm hotline at 512-974-0299. Achieved four-person staffing on ladders, engines, and heavy rescues due to the award of a $.51 million Staffing for Adequate Fire and Emergency Response (SAFER) grant. This grant allowed us to hire 36 firefighters and pay their salaries for two years. With this addition, AFD completed our four-person staffing plan, which began with a City Council Resolution in January 2008, more than five years ahead of schedule. Supported expanded footprint of the Gender-Neutral Locker Room project for all affected fire stations. Incorporated Chief Officer oversight of Facilities, Human Resources, and Payroll. Instituted 24/7 Shift Commander to provide continuity of operations. Instituted 24/7 Safety Chief to provide a constant safety presence on the fireground. Dedicated a Battalion Chief to addressing facility issues for more than 50 worksites. Expanded Fire Prevention section with additional fire inspectors and fire protection engineers. Oversaw the creation of the Wildfire Mitigation Division and became the largest fire department in the state of Texas, and possibly the United States, to have 100 percent of Operations firefighters certified to the NWCG Basic Wildland firefighter level. Increased the number of firefighters, adding numerous promotable positions. Achieved additional facility renovations and two new fire stations via 2012 bond and 2014 budget process. Supported the re-institution of Battalion Chief workdays and new Captain workdays for improved efficiency and communication. Initiated the Labor/Management Initiative to improve relations between labor and management. Established positions in the Regional Intelligence Center and the Joint Terrorism Taskforce. Proposed two additional Operations battalions to provide more appropriate span of control and leadership. Advocated for an Apparatus Specification Committee to ensure front-line firefighters are included in apparatus selection. Finalized and launched the region’s Community Wildfire Protection Plan (CWPP) in conjunction with Travis County. Expanded the formal commitment to include a seventh Emergency Services District (ESD)—#8. Formal agreements are now in place between AFD and ESDs 2,3,6,8,9,10, and 11. Mandated all Firefighters be issued leather firefighting boots for increased safety. Mandated all Firefighters be issued waterproof winter jackets for increased safety. Instituted a vendor contract to professionally clean and repair firefighting gear for increased safety. Approved shorts for uniform wear during hot summer months to provide increased firefighter comfort. Approved purchase of Plymovent systems to capture and remove diesel exhaust for a healthy work environment for firefighters. Approved purchase of new hose packs for increased fireground efficiency. Supported placing Thermal Imaging Cameras (TICs) on every unit for increased firefighter safety. Supported AFD’s completion and adoption of the 2012 International Fire Code and contribution to the adoption of the 2012 International Building Code, maintaining our position as an industry leader. Supported full implementation of the Wellness Center for firefighter wellness. Instituted individual e-mail addresses for all department personnel to enhance communication. Advocated for and established the Budget Committee for better fiscal controls. Instituted Daylight Savings Time overtime pay. Supported the hire of the department’s first Occupational Health Nurse. Instituted Catastrophic Leave without a contract. Fought for continuation of step raises without a contract. Supported Battalion Chiefs’ requests of no overtime for probationary firefighters. Placed limits on overtime in a rolling window; this is more expensive, but safer. Created the Chaplain Program for firefighter support. Support the creation of the Innovation Committee. Mandated support for Professional Development. Approved participation of Firefighters on specialty teams such as Texas Task Force 1. Supported the creation of the AFD Combat Challenge Team. Re-instituted the Department’s Awards Ceremony. Provided funding to assist with San Jacinto Night in support of the Austin Fire Museum. Supported the Department as the national pilot for the “Ready, Set, Go!” en Español campaign. Supported the successful completion of the grant deliverables that were required of the $252,600 FEMA grant we received in 2013. Those included installing 1,046 smoke alarms in 397 homes, purchasing a state-of-the-art model Fire Safety Trailer for community and public education events, conducted 40 fire safety training demonstrations that reached approximately 12,227 people (7,745 adults/seniors and 4,483 kids), and conducted four community outreach events specifically targeted to hearing-impaired individuals (reach: 100 people, installed 227 special smoke alarms). Supported the push for Firewise; Austin now leads the state with 12 nationally recognized Firewise communities. This support enabled Travis County to be selected as one of 10 counties from across the country as a pilot Fire-Adapted Community. Recognized by Allen Bergeron, the city’s Military Omsbudsman, and Dwain James, executive director of the Texas chapter of the Employer Support of the Guard and Reserve (EGSR) with a Department of Defense award for “best practices” approach in handling AFD personnel who are also members of the military. Awarded the Patriot Award through the Employer Support of the Guard and Reserve (ESGR) for outstanding support of AFD personnel who are active in the National Guard. The ESGR is a Department of Defense organization that seeks to promote a culture in which all United States employers support and value the military service of their employees. Who is Chief Rhoda Mae Kerr? Chief Kerr is at thirty year veteran and fourth-generation firefighter who began her career in the fire service in 1983. 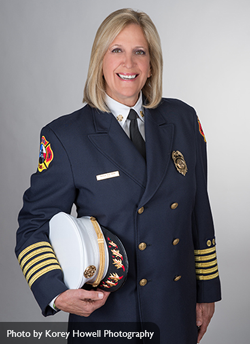 Kerr is currently the fire chief of the Austin Fire Department and first vice president of the International Association of Fire Chiefs, also known as IAFC. She will be sworn in as the president of the IAFC in August. Prior to beginning her tenure in Austin in 2009, Kerr served in the same position with the city of Little Rock, Ark., for five years. She was also deputy fire chief at Fort Lauderdale, Fla., for five years but with that department for more than 20 years; it was the place she began her career in firefighting. Prior to entering the fire service, Kerr was a coach and physical education teacher at the high school level for 12 years. Kerr has been an IAFC member since 1991. She is the past chair of the Human Relations Committee of the IAFC, past president of the National Society of Executive Fire Officers, and the past Southwest director of the National Society of Executive Fire Officers. She currently serves as the Secretary of the Metropolitan Fire Chiefs’ Association and is actively involved as a member of the “FireRescue” magazine editorial board and the Austin Area Urban League. She is also a member of the Texas Fire Chief’s Association, the Capital Area Fire Chief’s Association and the International Association of Women in the Fire and Emergency Services. Kerr also serves on the Advisory Committee for St. Edward’s University’s Public Safety Management Program and was recently honored as a 2013 Girl Scouts of Central Texas Woman of Distinction. Kerr has a master’s degree in public administration from Florida International University, a bachelor of arts degree in physical education and health from William Paterson University, an associate’s degree in fire science technology from Broward Community College, and two certifications from the Harvard University program — one for senior executives in state and local government and the other for the National Preparedness Leadership Initiative. She is also a graduate of the National Fire Academy’s Executive Fire Officer Program. Kerr is an avid sports enthusiast — enjoying cycling, golf, tennis and skiing. The Austin Fire Department was founded on Sept. 25, 1857 and is now one of the 20 largest departments in the country — with 45 fire stations located throughout the city and more than 1,100 employees. The IAFC represents the leadership of firefighters and emergency responders worldwide. IAFC members are the world’s leading experts in firefighters, emergency medical services, terrorism response, hazardous materials spills, natural disasters, search and rescue, and public safety legislation. Since 1873, the IAFC has provided a forum for its members to exchange ideas, develop professionally and uncover the latest products and services available to first responders.